Men can be notoriously difficult to buy gifts for, especially on a “holiday” such as Valentine’s Day. Some guys seem to have everything and don’t need anything, while others aren’t just into cheesy traditional Valentine’s gifts like pre-made cards, photo collages and handmade knick-knacks. But don’t worry because today, I’ve collected 5 guy-friendly, non-traditional gift ideas to treat your men this coming February 14th. 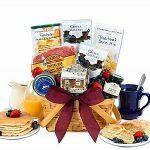 Jumpstart your love-filled Valentine’s Day with this gift basket filled with goodies for the perfect breakfast in bed for you and your sweetheart. A hearty, warm, country breakfast is certainly hard to beat! I mean, who can resist the aroma of pancakes and waffles, the delicious fresh country ham, the wild Maine blueberries and blueberry jam? 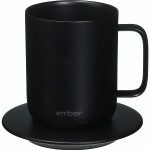 Speaking of mornings, make sure your hubby’s coffee or tea is kept at the perfect temperature from the fist sip to the last with this temperature-controlled ceramic mug from the brand Ember. This #1 Best Seller can be connected to any iOS or Android device, and pairs with the Ember app to remotely change your mug’s temperature, LED color, and more. This mug is also very intuitive as it enters sleep mode when empty, and wakes hp when it senses movement or liquid. If you’re surprised that there’s such thing as a “smart” mug, then you’ll probably freak out if I tell you that my next gift idea is a Smart Belt. 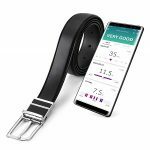 Yes, this adjustable men’s leather belt can be connected to any iOS or Android device to keep track of the user’s overall health by measuring waist size, steps taken, sitting time, and overeating habits. So it’s basically a Fitbit but in a belt form. But unlike other smart watches, this belt can measure his waist circumference using the sensor inside the buckle. 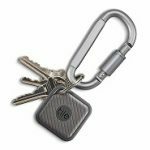 Next on this gift list is Tile’s most powerful and durable tracker, which can easily find lost items, such as keys, phone, wallet, etc. This is definitely a gift that he will surely put into good use. So yeah, we’ve really come to this age and time when technology via phone apps have already replaced an array of credit and loyalty cards, making huge, bulky wallets a thing of the past. 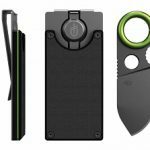 So instead of gifting him with a new leather wallet, why not just get him this Gerber GDC Money Clip that does not only hold up to five essential cards, but also comes with a 1.75-inch fine edge stainless steel blade knife that may come handy any time of the day. These gift ideas are perfect for any occasion, and not just for Valentine’s Day. So make sure to check these gift ideas out because each item on the list is guaranteed to put a smile on your guy’s face. This entry was posted in Dating, General, Love and Marriage and tagged Gift Ideas, gift list, Valentine's Day. Bookmark the permalink.